Today I got a sale on CashBot besides Rui..
Is there a way to actually know? Nope. 0 sales for me right now. Must have been someone else. OK, I think I know what happened then. Giving the software and admin the benefit of the doubt, SS' sale that should have passed up to me was possibly also one of my pass ups. So instead of going to me it went up to at least the next level above me and possibly even higher. BTW, I always send a welcome email to my referrals because the site give no banners. Just something simple. I'm hoping I could add your banners to it SS. This is a great idea but they do not offer any promotional banners. So adding your banner to these will give our team a huge advantage over the other teams. TrafficG has a really fast delivery but it seems BoB provides more clicks for the same amount of impressions. 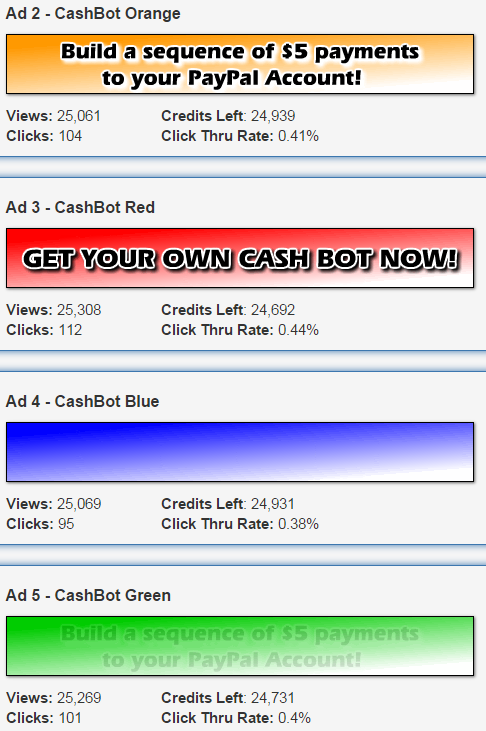 To tell the truth, I haven't seen anything close to these click through rates on any other program I've used! Also it seems the red banner has taken the lead in attracting the attention. What is the exact date of the email you received from PayPal regarding the sale you got right after my purchase? If it falls between Rui's and the other one then it should be normal, otherwise it's kinda weird.. based on their tree/plan. Can pass ups from our referrals become our own pass ups to our upline? Is that normal? That's ok, here are the 728 versions. I've been thinking of adding something like a signature on the banners with small letters in the bottom right corner maybe. Something like "The X-PTCBox Team" or sth, this way we can trademark our banners and get some branding for our team. This way people will get to eventually know when it's us referring them, kinda like what Dan has suggested years ago. Also I need to make a 125x125 version for cashbot as well. Btw, do you have any suggestions for changes on the text and/or maybe an image? I could also do that rebate oriented banner. Too late for my paidverts campaign I used my blurry enlarged one. I'll use it next time. Hmm.. so here are some more 728 including the girl image.. Ok I'm not so good when it comes to photo editing so the result may not seem great but well.. that's just one attempt.. future ones will get better.. hopefully.. I'm still not sure how the 125x125 should look like..
Well.. it's time to sleep now..